How to Manage Credit Cards Efficiently? And use them in such a manner that I get thousands of rupees worth gifts and cash back each year. I will show you how I do it but before I begin please understand that you may not need so many credit cards and you don’t need to manage so many credit cards to get the same benefits. The idea is to managing your credit cards efficiently so you can earn money each time you purchase something. I can manage more number of credit cards because I purchase lot of things online and have a complete business of websites, domains and hosting online and so I can spend lot of money on my credit cards and manage them efficiently. So don’t think that having more cards can help but the idea is to manage them in a manner such that you get most benefits out of your day-to-day purchasing activity. The first step to managing your credit cards is to understand the terms of service or terms of usage. There are very few people who actually read them but I always read them. Remember these terms are not the ones that your sales person tells you but these terms are in the booklet that you get along with your new credit card. Ideally you should know them before applying for a credit card. You can read about the terms for your card you are applying online. It makes me aware of the minimum amount I need to spend on each of those credit cards each year to make them free for me and I don’t need to pay anything for using those cards. So the first point of having a credit card is to use it because there are very few credit cards that offer you completely free card even if you don’t use it. SBI card is an exception and they don’t charge anything even if you just have the card and don’t use it for years but that is one of such cards. All other credit cards may charge you yearly fees for non-usage. My Citibank credit card offers me cash back but they also need that I use my card for at least 20,000 Rs per year to make fees waived off. Always make an ECS payment from your bank account for each of your credit card. I always do 100% payment to be debited from my bank account. I never want to be found guilty of not making a payment even if I am not around my computers for few days to make the payment but if you don’t prefer 100% payment, make sure you opt for minimum payment due to be debited from your bank account. It does not make any sense to be using your credit card for minor loan or making a due rollover to next month because the interest rate on credit cards is very high. This is the only reason I recommend you to have 100% payment as ECS from your bank account to your credit card. Use other means of loan if you actually need it. Even a personal loan is better than loan on a credit card. Apart from that never ever use your credit card for cash withdrawal because that has even higher interest rate. Just remember never purchase anything from your credit card that you think you cannot pay by the due date. I have seen lots of Indians are afraid when it comes to using a credit card. I am not talking about people who are 50+ because they are not used to using cards anyway but even computer geek’s or even an MBA from reputable colleges are afraid of having a credit card. They are even terrified when using it online. This does not mean you should be using your credit card online everywhere but if you see a reliable Internet payment processor or verified by Visa things on the site you should be fine using your credit card on that site. Tip: If you see a transaction in your credit card statement that you are sure is not done by you, you can call your credit card company and get your card hot listed and launch a complain about the transaction. They would investigate and credit your money back for the transaction. Do this only if you are 100% sure or else you may be charged a fee for the unnecessary complain. You may wonder how I am able to manage so many cards, their payment dates and other such stuff. I have a complete plan the way I use my credit cards. Remember I don’t need to worry about the payments because they are always taken from my bank accounts and so this means I never have to worry about that part of my credit card management. This also means for all my credit cards, I have never missed a payment till date. 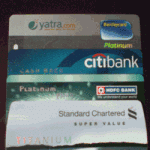 Standard Chartered Bank Credit card is used for making payments for my hosting, domains and other online stuffs. HDFC Bank card is used in Google Adwords and at CESC (my electric bills). Barclays Card is used in Bing Adcenter and Facebook Advertising as well as in one of my smaller Adwords Account. Citibank card is used mainly for booking tickets online, making offline purchases like my MacBook Pro as well as pay my telephone and internet bills for my home and office. SBI Card is used for recharge my prepaid mobiles and DTH accounts as I have very small credit limit in SBI Card. Let me show you some of the benefits I get when using my credit cards. 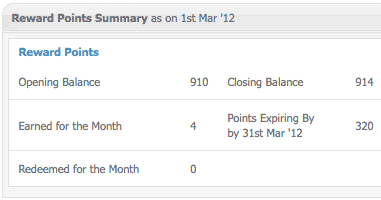 HDFC Bank’s credit card is the most heavily used card and so I accumulate lot of reward points with them. I have accumulated lot of points in the card without redeeming it because they have PlayStation as an option if you make 20,000+ rewards points which I think is not very far for me. Apart from that they also offer cash back for my electricity bills which when paid offline would mean I have to waste time visiting the place to make the payment. It not only saves me time but also pays me back for using it. 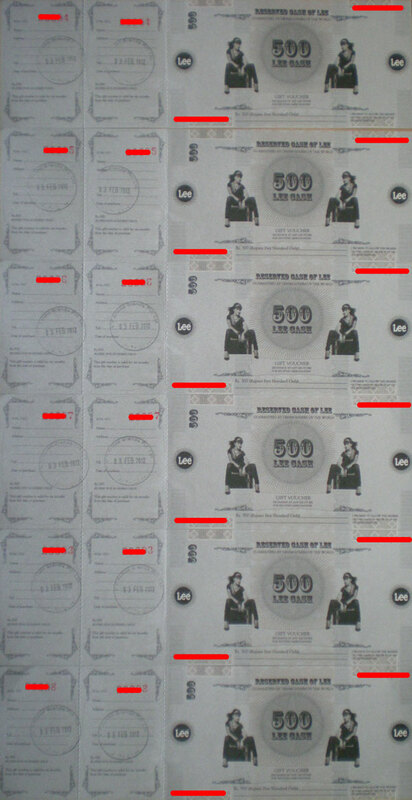 Barclay cards offer gifts vouchers of various brands and I personally prefer Lee vouchers from the pack. I get 1 or 2 Lee jeans each year just for using my Barclays Credit Card. Indirectly Bing, Google and Facebook sponsors my Lee Wardrobe. 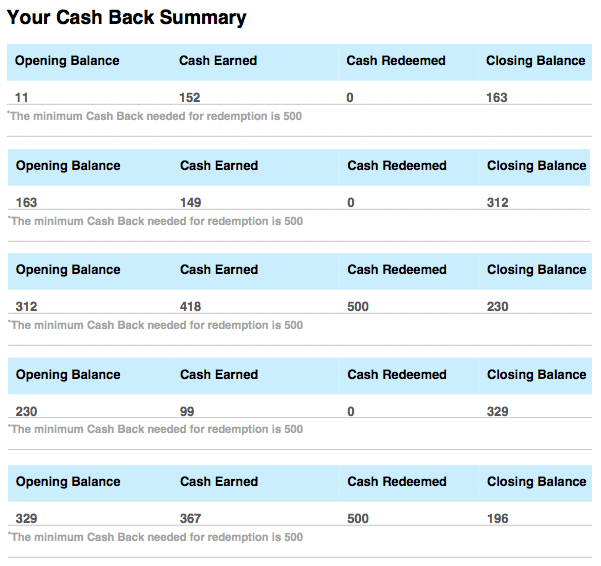 Citibank card is one of those cards where I get instant cash back and you can see how I managed 2 cash back’s in the last 5 months. I make all my USD payments through my Standard Chartered bank card because they have very good online interface for details about the transactions and so I can get details about any transactions before a statement is generated and it helps me if I need to verify my credit cards anywhere by entering the transaction ID or things like those. Apart from that like HDFC Bank card, Standard Chartered Bank card also offers lot of options and items as rewards and so it makes more sense to accumulate lot more points before redemption. SBI Bank Credit cards is not very heavily used and so I don’t make anything significant as rewards from them but still I am accumulating points which I can redeem for big rewards when I think they are worth it. According to me everyone should have a credit card and learn how to benefit from it. I am damn sure there will be no one who don’t pay electricity bills, telephone bills and make mobile and DTH recharges and just doing them with your credit card can not only save you lot of time but also help you get some rewards out of it. Do you agree that credit cards can actually help you actually earn money? Share your views in comments below. You are here: Home / Other / How to Manage Credit Cards Efficiently?